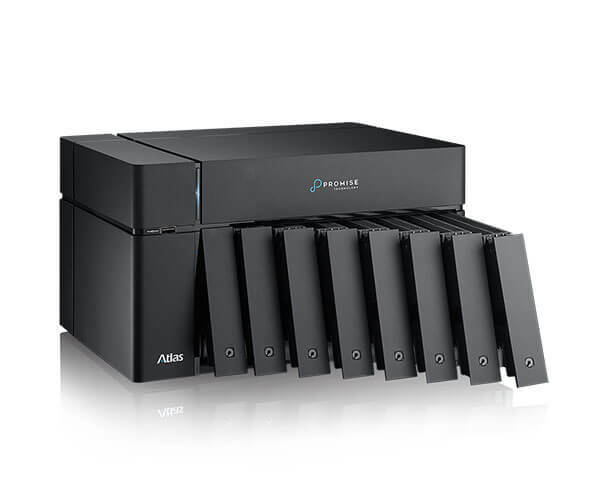 Whether you are a small studio or mid-sized business, you can easily set up the Atlas S8+ and start storing and sharing content quickly with your team. The Thunderbolt™ 3 or 10GbE models give you the flexibility that fits every need, with multiple 1GbE ports available on both for additional clients. 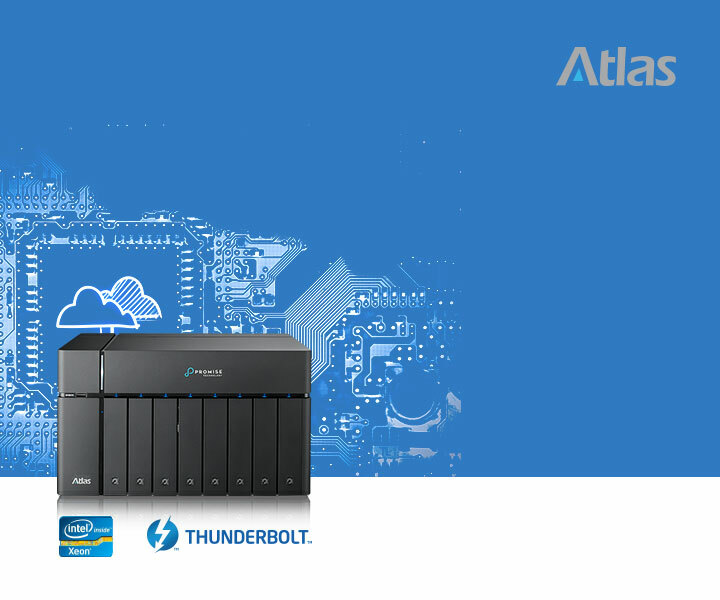 With eight 7200 RPM drives and a Quad-Core Intel processor, the Atlas S8+ is well equipped to handle multiple clients with demanding workloads over Thunderbolt™ 3 or 10GbE, while sustaining other clients over 1GbE. Add your own SSD into the enclosure for even faster response with included flash cache feature. 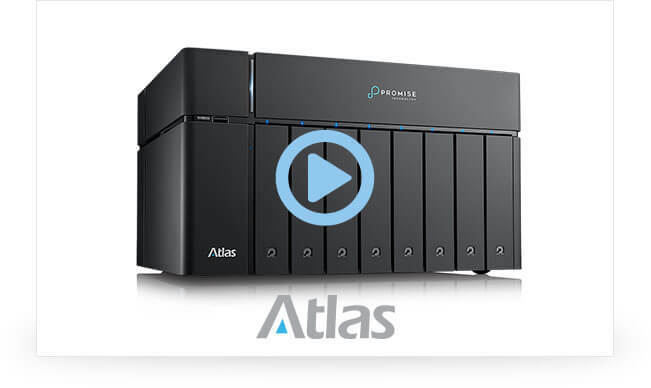 Atlas S8+ leverages an Enterprise-class NAS operating system with advanced Data Services behind a simple-to-use interface. Complete Backup solutions included for local and Cloud Enhanced Encryption to secure your data. 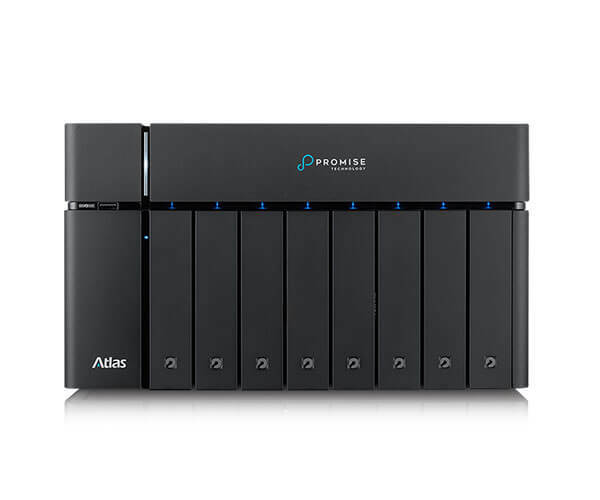 Virtualization ready and certified for VMWare, Citrix and Hyper-V.
Atlas S8+ models come fully tested and integrated with drives, with models offering 32, 64, and 80TB raw capacities. 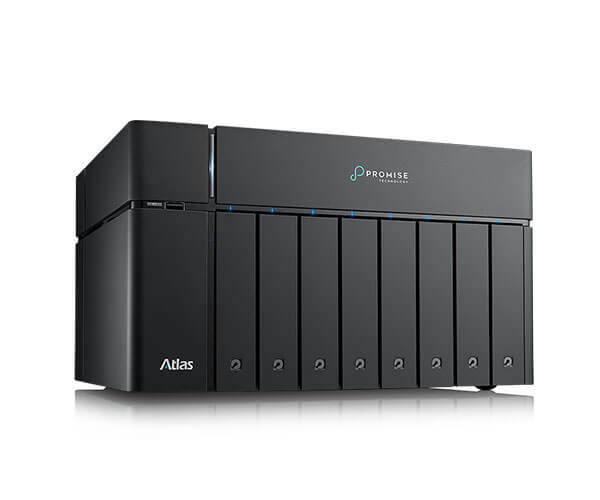 Additional configurations will soon be available as Built to Order, with up to a massive 112TB on your desktop. Fully integrated, ready to use NAS appliance, 8 7200 rpm HDDs, fully integrated and tested, a choice of capacities. 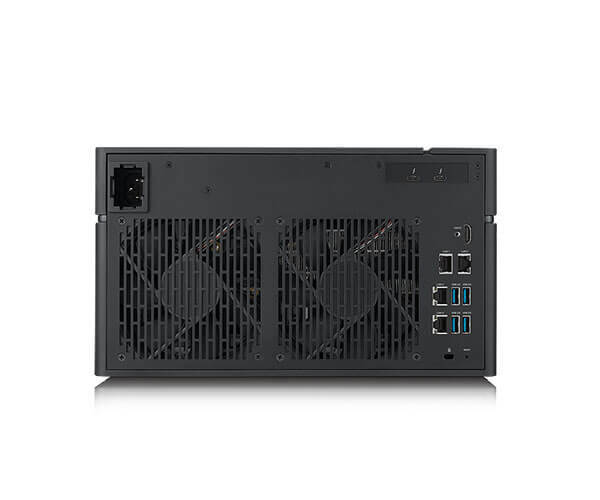 Comes with Quad 1Gbit ports and Dual 40Gbit Thunderbolt™ 3 Host Ethernet based connectivity. Ideal for Rich Media and IT Professionals that are in need of Enterprise Class Data Services and features . Enterprise Class Data Services and features. Enhanced encryption to secure data. Simple, intuitive setup and management. Local and Cloud Backup solution. Fully supports Windows Active Directory (AD). Apple Open Directory (Apple’s version of slapd) requires an external Linux client to import the Samba Schema in order to use CIFS. Open LDAP requires the Samba Schema to be imported in order to use CIFS. Please refer to your Linux distribution for more information. Lifeboat Distribution, a subsidiary of Wayside Technology Group, Inc. (NASDAQ: WSTG) and international value-added distributor for virtualization, security, business continuity and emerging technologies, announced today a distribution agreement with Promise Technology. 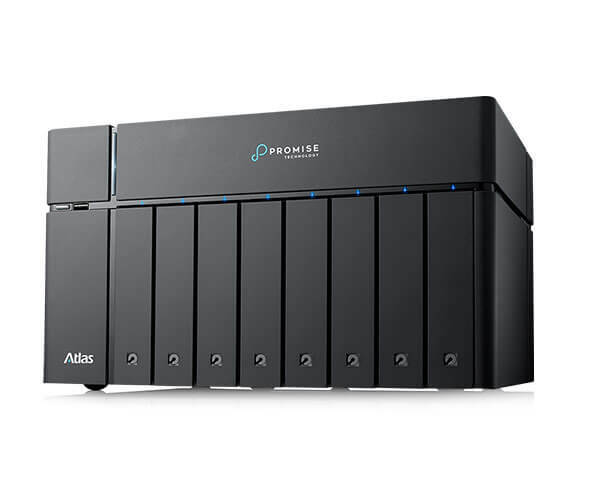 Leading storage solutions provider Promise Technology Inc. today announced the immediate availability of the new Atlas S8+, an 8-bay desktop appliance that combines enterprise-class features with a simple-to-use interface. The Atlas S8+ is ideal for creative professionals and small groups involved with hi-res video editing and production workflows who don’t want to sacrifice performance for affordability. IT managers will appreciate the ease of setup, speed and rich features.